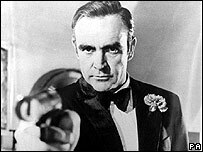 Sir Sean Connery has been voted the best James Bond of all time, in a magazine poll. Pierce Brosnan was placed second in the survey of 3,000 readers by SFX magazine, followed by Sir Roger Moore, Timothy Dalton and George Lazenby. "Connery is the still the ultimate 007," said SFX editor Dave Bradley, who added: "New Bond Daniel Craig has very tough acts to follow." Craig's first film as Bond, Casino Royale, opens on 17 November. The 21st official Bond movie is based on the first of Ian Fleming's celebrated spy novels. SFX voters named Sir Sean's 1964 outing, Goldfinger, as the best of the series.